The design of the composite beam bridge by REIDsteel is suitable to span a range of 10m to 20m - up to 30m. The Carriageways are supported by pairs of beams at 1.7m centres. A carriage way may therefore be 5.1m overall wide, with 1.2m walkways both sides. The carriageways may be wider in increments of 3.4m; and may always be extended widthways in increments of 3.4m. There is an element of choice in the marked carriageway widths and the widths of the walkways. The minimum steel bridge will be single lane with a 4m marked roadway. They will have a local Reinforced Concrete deck of 0.275m thick, placed on our lost steel formwork decking with no propping needed. They can have 0.05m of surfacing. The concrete will become composite with the steel via shear connectors. They have steel crash barriers on both sides of the carriageways. The walkways will be outside the crash barriers and will have handrails on the outside. The Bridge Decks are carried by 2 or more pairs of beams below deck level. There is no steel above the deck other than barriers. Please note that the roadway will have to be at a height well above the flood level: as a guide the depth of the beam is about 6% of the span, and the roadway is above this truss. The bridge decks are cambered from side to side by offsetting the beam heights; and slightly cambered from end to end using the built in camber of the beams. All spans are simply supported. The deck of the walkways are local reinforced concrete 0.125m thick placed on our lost formwork decking. The design is built to British Standard BS 5400 for any number of lanes of full highway loading, and for 30 units of HB loading, equivalent to an occasional 120 tonne truck. All the structural design is in house by REIDsteel. The bridges can be erected in-situ by simply lifting beams individually into position or may be built on the 'home bank' and Cantilever Launched in pairs across the gap. For the cantilever launch, a 'Launch Kit' is needed, consisting of sets of rollers, a steel 'launching nose' fitted to the leading edge of the pair of beams (and removed for re-use after launch), and come-along cable jacks. The design of the bridges allows them to be combined with other bridges to make multi-span crossings. Again the bridges can be built in-situ; or they can be cantilever launched. For multi-span bridges which are to be cantilever launched it is necessary to use a 'Link Kit' which consists of further sets of rollers, and further jacks, and a set of link steelwork which joins adjacent bridges during the launch and roll-out. As with the Launch Kits, the Link Kits can be used again and again. You will need one Link Kit for a 2-span bridge and 2 Link Kits for a 3-span bridge and so on. 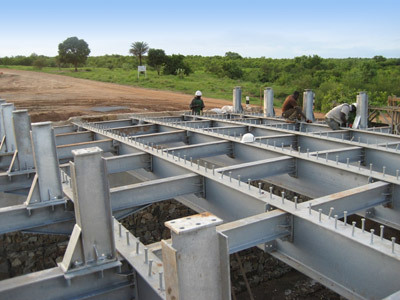 A composite steel beam bridge is economical for spans of 10m to 18m, though bridges up to about 30m are possible. A composite steel beam bridge can easily be expanded widthways. If through-truss or stayed bridges are not wanted for architectural reasons, composite steel beam bridges may be selected. It is easy to run services under the carriageway. It is relatively easy to cantilever launch as long as there is a run up on the home bank of about 110% of the span. Because only one pair of beams needs to be launched at one time, the launch process is simplified. The composite beam bridge is good for multiple spans. Note that the carriage way will be higher than the abutments by about 6% of the span, which may mean big embankment approaches. To find out more about your Composite Beam Bridge specific requirements, please complete our Highway Bridge Enquiry Form.